This 40 mile asphalt and crushed limestone trail is a former military marching route which connects Madison to Dodgeville in the west. It’s a great route for escaping the city for a long pace run, with plenty of observation decks looking out on agricultural lands, woods, wetlands, and prairies. You can hop onto the path at any juncture of its 40 mile length. 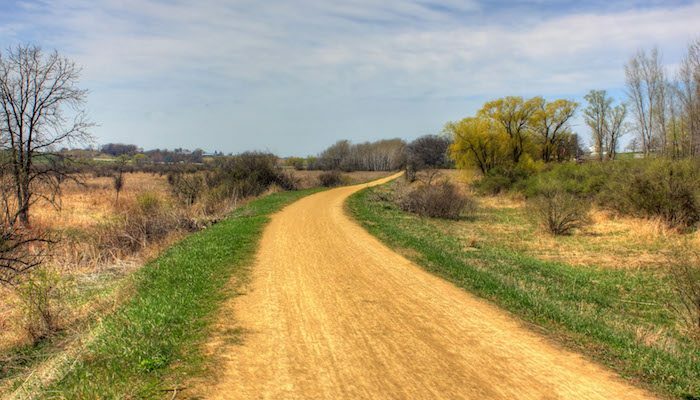 The closest section to Madison is on the Fitchburg area, where the Military Ridge Trail nearly connects to the Capital City Trail and the Badger State Trail. One of the coolest areas to explore is where the path passes through Blue Mound State Park (halfway along the trail, about an hour outside the city). Blue Mound has over 15 miles trails that are popular among mountain bikers, but runners will love them for their views. See links to the trail map, which has segment distances, as well as a trail map for Blue Mound. Our ‘route map’ is the three miles skirting the outside of Blue Mound. Trail is 40 miles. See trail map for segment distances.